1834. 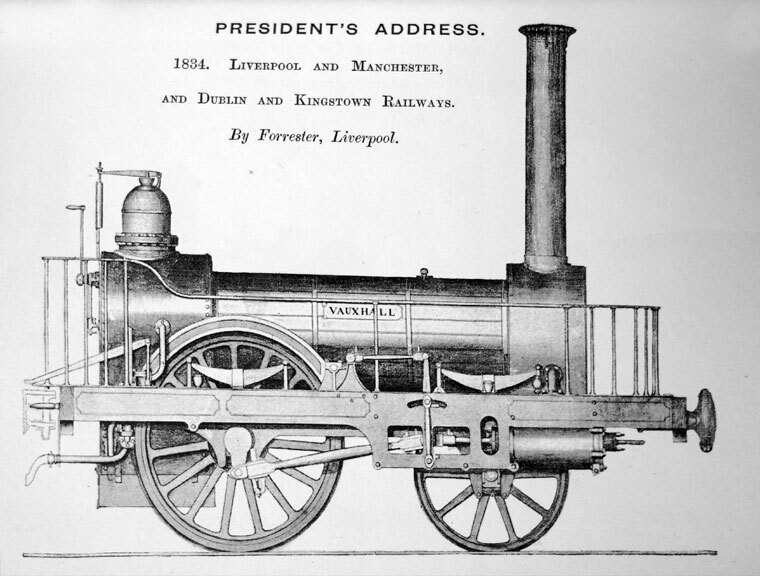 The Vauxhall built by George Forrester and Co for the Liverpool and Manchester Railway. The works manager was Alexander Allan until 1840 when he left to take charge of the workshops of the Grand Junction Railway at Edge Hill. 1847 The largest order was for fifteen 2-4-0s for the South Eastern Railway. These were of the Stephenson "long boiler" pattern. 1881 Made the hauling engine and triple reduction gearing for the Honolulu Marine Railway (a slipway for the repair of ships up to 1500 tons displacement and 180 ft long). Special chains with long links were made by Henry Wood and Co of Liverpool. 1892 Liquidation of the company. Six-column beam engine at the Mersey Docks and Harbour Board workshops in Birkenhead, photographed by George Watkins in 1935. The 1890 O.S. map shows 'Vauxhall Foundry (Disused)' with its entrance on Vauxhall Road, and bounded on the north by Banastre Street, on the south by Midghall Street, and on the east by Stockdale Street and by low quality housing. A branch of the Leeds & Liverpool Canal terminated a short distance from the NE corner of the foundry. Everything of interest has been cleared, and only Midghall St. and Vauxhall Rd. remain. ↑  Gazette Issue 22065 published on the 20 November 1857. This page was last edited on 28 October 2016, at 20:06.